MAVO LF/MAVO/TERRA 4K can record compressed RAW as cDNG with adjustable compression ratio without external recorder. Current firmware KineOS6.1 supports three different compression ratios, 3:1, 5:1 and 7:1 and all of them get super good image quality and enough room for grading work. Uncompressed CinemaDNG: KineRAW-S35, KineRAW-MINI and KineMINI/KineMAX can record in-camera CinemaDNG natively. The uncompressed CinemaDNG is supported by most post software. CinemaDNG with Lossless Compression: it is also friendly for post softwares. However, for high resolution and frame rate, no matter uncompressed DNG or lossless compressed DNG, data rate is too large to record more than 4K 60fps image in camera. CinemaDNG with Lossy Compression: or cDNG. With different compression ratio, it is suitable for recording high resolution with high frame rate like 6k 50fps. However only DaVinci Resolve and SCRATCH v9.0 support cDNG natively now. 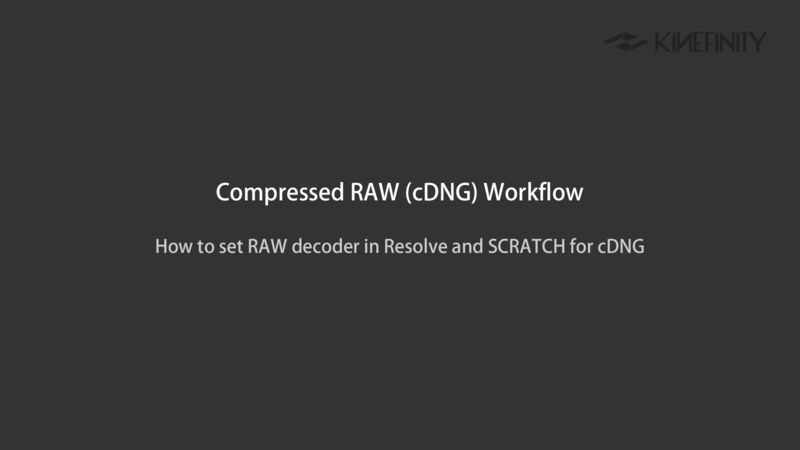 SCRATCH V9.0 natively supports compressed RAW as cDNG in the best way for Kinefinity footages: as soon as importing clips into SCRATCH, it will apply the LUT when monitoring, and will link the audio file automatically. If disabling the LUT, RAW with native KineLOG3 obtained is the same with ProRes with KineLOG3. 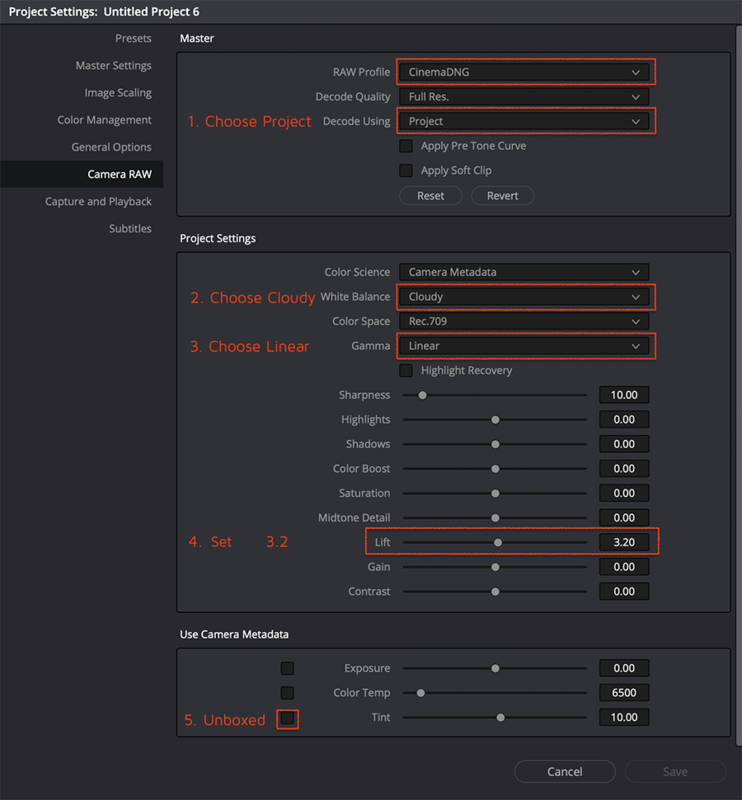 If you are familiar with the workflow of SCRATCH and enjoy the efficiency it brings, we recommend SCRATCH v9.0 as color correction tool of cDNG or SCRATCH Player Pro for DIT. Tint: unboxed, default setting is . After above setting, Kinefinity cDNG could be imported in batch to get RAW with native KineLOG3, correct exposure and correct color. Similar to ARRI RAW process, footages are imported to Resolve to get logged clips, very convenient and intuitively. No matter grade clips directly from LOG color space or load 3rd-party LUT, the workflow will be smooth and highly productive . Note: Recommend to employ the official LUTs as the starting point for the grading work. KineNEUTM, fit for MAVO LF/MAVO. If the LUT is selected when shooting, the clips folder will contain the LUT, which is convenient to load it directly in post work. The above LUT is also available in Kinefinity Official LUT Collection. This entry was posted in Workflow and tagged 6K, cDNG, CinemaDNG, LF, MAVO, RAW, TERRA.